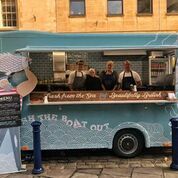 The truck officially launched at this year’s Festive Street Food Market in Kingsmead Square, which opened on 22nd November and will run from Thursday to Sunday, 11am-9pm, throughout the duration of the Bath Christmas Market. Fans of The Scallop Shell’s best of British seafood will find classics such as prime Cornish hake fillet with homemade tartare sauce, or smoked salmon fishcakes with cocktail sauce – both served, of course, with the SC’s legendary chips – alongside a luxurious langoustine bisque with chips and aioli. The winner of the Fish and Chip Restaurant of the Year Award will be announced at The National Fish & Chip Awards’ 31st anniversary ceremony in London on 24 January 2019. Good luck Garry and The Scallop Shell team – we know you can do it!